Q: US President Trump said yesterday that Treasury Secretary Mnuchin will visit China in the coming days. Do you have any details, like when he and the other US officials might come to discuss the trade dispute between China and the US? A: We have noted President Trump's words. You mentioned that the US side recently stated that Treasury Secretary Mnuchin will come to China and discuss China-US trade issues. The spokesperson of the Commerce Ministry has already made clear China's attitude: China has received information from the US side about hoping to come to Beijing to discuss trade issues. China welcomes this. Beyond that, I would refer you to the competent authority for specific details. Q: The G7 Foreign Ministers' Meeting concluded with a joint communique which contains some China-related contents. What is your comment? A: We have noted that the joint communique released by a meeting of several foreign ministers in Canada incorporates some China-related contents. We believe that under the cloak of international law, these contents made irresponsible comments on the East China Sea issue, the South China Sea issue and China's human rights records. China is firmly opposed to these words and deeds that show no respect for truth and no sense of responsibility. China's position on the relevant maritime issue is clear-cut and consistent. China is always committed to working with the parities directly concerned to properly manage and resolve relevant differences through negotiation and consultation, advance cooperation in various areas, jointly uphold peace and stability of the relevant waters in the region, and safeguard freedom of navigation and overflight and security of sea passages. With regard to the issue of human rights, the Chinese government always attaches great importance to the human rights cause and has made great efforts which have yielded well-recognized remarkable achievements. The Chinese people have the best say in this regard. We ask the relevant countries to respect facts, especially when it comes to maritime issues. They should also respect the efforts made by regional countries to uphold stability while focusing on cooperation and development, and refrain from stirring up troubles and making irresponsible remarks. 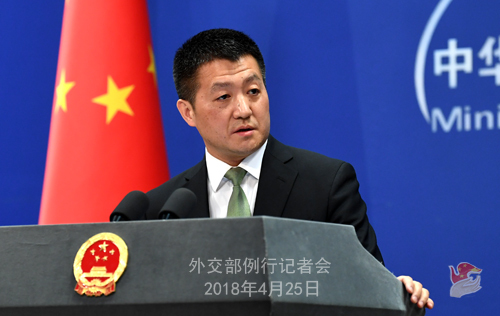 We urge certain countries to abandon their ideological prejudices, view the development of China's human rights cause in an objective and impartial manner, and make no more attempts to interfere in China's internal affairs under the pretext of human rights issue because such attempts are doomed to fail. Q: A partner at a private equity firm was found guilty of insider trading in a US court on Tuesday. Are you aware of this case at all? Do you have any comment on that? A: I am not aware of what you said. I want to say that if one party wants to accuse another country of something, it'd better have some facts as evidence. Q: According to reports, on April 24, the US Consul-General to Hong Kong said that China doesn't abide by the WTO rules, which harms the US interests and that China's economic volume and its success in world economy has catalyzed the idea that the global trade rules can be ignored. He hopes that China can change its course of action and honor its commitments under the WTO framework and in the US-China bilateral talks. What is your comment? A: I think it would be nice if the US side now wants to talk about following the WTO rules. In fact, if you follow the discussions that have been taking place these days inside the WTO in Geneva, you will have no difficulty in finding out just how eagerly the WTO members wish the US side could abide by the WTO rules and uphold the multilateral trading regime with the WTO rules at the core. Regarding China's compliance with the WTO rules, if the US side truly believes that we have violated the WTO rules, we would like to know what solid evidence can it provide? Whether a WTO member has violated the WTO rules or not can only be determined within the WTO framework. No single member has the right to make a unilateral ruling on that. The undeniable fact is that since its accession to the WTO, China has been strictly fulfilling its membership obligations and observing the WTO rules. China has been firmly supporting the multilateral trading regime as an active participant and an important contributor. Whatever remarkable achievements we have made in our development endeavors, they were made because we honor the international rules and we are a hardworking people. As I said yesterday, it is not surprising for China and the US to have some differences in the trade area. These differences can be resolved through bilateral consultations or within mutually recognized multilateral frameworks, but unilateral actions will offer no way out. Q: On April 24, the EU published its annual reports on the Hong Kong Special Administrative Region (SAR) and the Macau SAR. What is your response? A: Since the return of Hong Kong and Macau, the implementation of the "one country, two systems" principle has been a success with well-recognized achievements. The EU, by issuing these two reports which contain no facts in them but irresponsible comments on China's domestic affairs, has tried in vain to interfere in China's internal affairs and in the affairs of the two SARs. They will earn nothing but aversion from the Chinese people. Q: According to the website of the Belarusian President, on April 24, President Alexander Lukashenko said in his annual address that China's Belt and Road Initiative is a new type of collaboration model between countries based on the principle of mutual support and common development. Belarus is an active and equal participator of the Belt and Road Initiative. What is your comment? A: After President Xi Jinping proposed the Belt and Road Initiative, Belarus responded positively and has been playing an active part in it. The Belt and Road Initiative has also brought good opportunities and established a broad platform for China-Belarus cooperation. Now, China is Belarus' third largest trading partner, and major cooperation projects as represented by the China-Belarus industrial park have made sound progress. The successful cooperation between China and Belarus to advance this Initiative once again proves that the Belt and Road Initiative, which aims to realize win-win results under the principle of extensive consultation, joint contribution and shared benefits, can promote the socioeconomic development of the participating countries and improve the livelihood of their people. 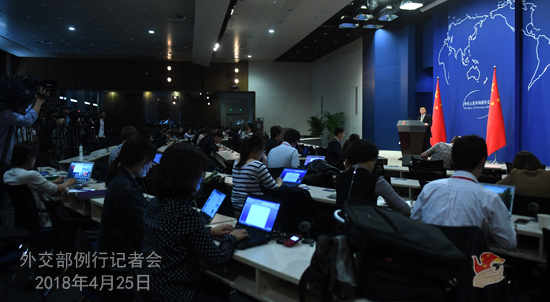 Q: In recent days, we have seen several cases of traffic accidents involving Chinese nationals overseas. The May Day holiday is just around the corner. Does the Foreign Ministry have anything safety-wise to say to the Chinese people who will be travelling abroad during the holiday peak season? A: This is a timely question. There have been a succession of traffic accidents overseas these past few days which have caused many casualties and big property loss. The Foreign Ministry and the Chinese diplomatic missions in the relevant countries attach high importance to these cases and have been making all-out efforts to ensure the legitimate rights and interests of Chinese citizens. Here, on the occasion of the upcoming May Day holiday, I would like to make some special reminders. Safety shall come as a priority for all those that plan to travel abroad during the holiday. You may check on the consular service website of the Foreign Ministry (cs.mfa.gov.cn), the "China Consular Affairs" account on WeChat (Ls12308) and on Weibo for information on safety alerts and travel advice. Overseas travelers are well advised to heighten risk awareness, abide by local laws and regulations, respect local customs and conventions, pay attention to traffic safety, and avoid "red-eye" journeys whenever possible. In case of emergency, besides calling the local police, you can also dial the 12308 hot-line (86-10-12308) of the Chinese Foreign Ministry's Global Emergency Call Center for Consular Protection at any time. Our embassies and consulates overseas are also always ready to help. 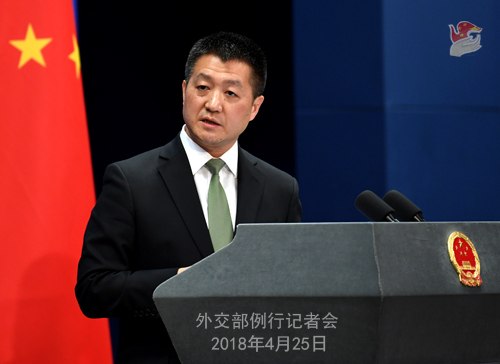 The Foreign Ministry and the Chinese diplomatic missions overseas will continue to coordinate efforts with relevant countries to ensure that concrete and necessary measures are in place to guarantee the safety of Chinese tourists. We hope that everyone could have a pleasant and safe trip.